If you want to place a heavy bag at home and train at any time can be used special equipment. 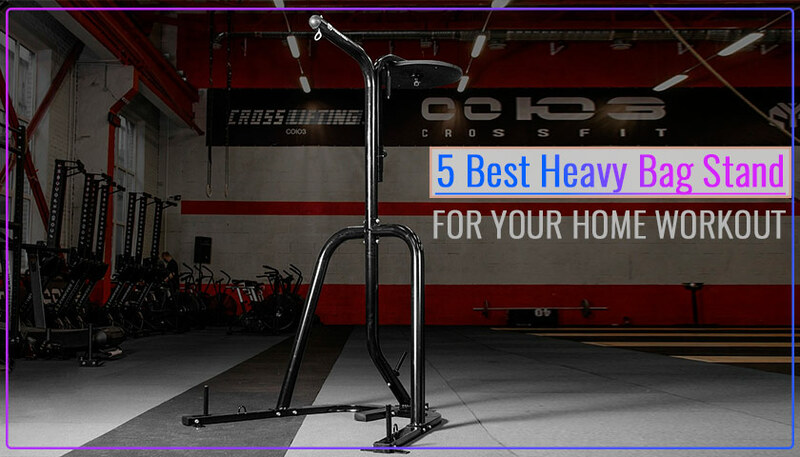 In this review we will look at 5 Best Heavy Bag Stands. Let’s compare their advantages and possibilities of use. This will allow you to make a choice when buying, quickly find the right equipment for your home gym. At the beginning we will compare models by main characteristics, then we will consider detailed reviews. As a bonus, we have collected information in the Universal Buyers Guide. Let’s begin. This equipment includes Heavy Bag and Speed Bag Stand in one design. This allows you to simplify a complex exercise and allows you to train comfortably and functionally. Heavy-duty bag attachment withstands loads up to 100 pounds (45.36 kg). The platform for fastening the speed bag is adjustable, which is extremely important for a full workout. At the bottom of the legs there are additional fasteners for fixing the bag. In some cases it is convenient. We should also note the high quality of this equipment. The frame structure is made of durable steel. It is comfortable and functional. For greater stability, you can use extra weight. Free-Standing Station Steel Boxing MMA Heavy Bag Stand. Perfect for practicing punches or kicks. With compact size allows you to use a large heavy bag. The design is highly resistant. This allows you to work out the most severe kicks and knees without fear that the design will go down or stagger. The frame is made of durable steel pipe. This provides strength. In this case, the weight of the rack allows you to simply move the equipment if necessary. One of the advantages is convenient access to 180 degrees. Your training will be as convenient as possible. Also, users are attracted by the bright design of this model. The height of this equipment allows you to use a heavy bag of almost any height. Three-Station Heavy Duty Punching Bag Stand by Everlast allows you to use three types of bag at the same time. Supported by a Heavy bag weighing up to 100 pounds (45.36 kg). This will be enough for almost all types of bags. The functionality is combined with the comfort of training. Hooks are placed on three sides. Therefore, it is convenient to approach any of the bags. The width of the legs makes the design as stable as possible. The optimal size combines the ability to place this Bag Stand in the garage gym and in a large gym. Good quality is provided by a strong steel frame. On the legs are installed protective plastic plugs that protect the floor from damage. This pear rack is ideal for home workouts. It is used for heavy bag and can be placed in any free corner of the room. The weight of the equipment is only 47 pounds. Assembly is as simple as possible. According to the Assembly instructions, it will take about thirty minutes. The design has optimal dimensions and stable legs. The frame is made of durable steel elements and can withstand a bag weighing up to 330 pounds (149.69 kg). For maximum stability can be used additional weighting or fixing to the floor using mounting on the legs of the frame. The height and endurance of this stand allows you to use bags of different size and weight. It is suitable for both beginners and more experienced fighters. A feature of this model is convenient legs that do not contain pins for additional weight. These makes training more convenient. The frame is attached to the floor and the weight of the structure allows you to make the Stand as stable as possible. It is possible to use a bag weighing up to 300 lbs up to 6 feet (182.88 cm). You will be able to work out kicks and hands. The manufacturer from the USA offers a lifetime warranty. QUALITY It is difficult to assess the quality of choosing products online. But you can compare the models by weight, take into account the material from which the frame is made. In addition, pay attention to the warranty conditions. MAX WEIGHT ON STAND Consider the weight of the bag you plan to use for training. We recommend choosing the most durable model. If you replace the bag you will not need to replace the Bag Stand. PRICE The average Cost of such equipment is $100 – 200. Choosing a place of purchase is to clarify the terms and conditions of delivery, warranty. FUNCTIONALITY Some models allow you to hang two or three types of bags. This allows you to train more effectively and varied. EASE OF USE Comfort of use involves the possibility of simple Assembly and installation of the structure. Suitable size and mounting options. Good overview. It would be cool to also do a review on the heavy bags. There are a lot of them, I would like to choose for use at home. Excellent overview. Long thought where to attach the bag. It was difficult to attach the hook to the ceiling. In the end, bought a Heavy Bag Stand and I have already involved two bags. Happy with the purchase.